Please join us for the first segment of Counter-Intelligence: Part 1 – The Company. (1 hour 18 min.) The accolades below speak for themselves about this amazing work. The debate of March 6, 2011, at the Boulder campus of the University of Colorado, between Richard Gage, AIA, and Chris Mohr, Denver investigative journalist, continues with this excellent rebuttal by Jeremy Hammond to Chris Mohr’s claims. A dialog between Mr. Hammond and Mr. Mohr is also posted at the end of this article. Here is the audio of that debate hosted by Colorado 9/11 Visibility and co-sponsored by Rocky Mountain Peace and Justice Center, and We Are Change Colorado. September 16, 2011 Chris Mohr at Skeptic magazine writes that “conspiracists are working hard to publicize their claims of scientific validity to the conjecture that the World Trade Center buildings were destroyed through controlled demolition.” He mentions a debate he had with Richard Gage, the founder of Architects & Engineers for 9/11 Truth, where more than 1,500 professional architects and engineers who question the official explanation for the collapse of the three World Trade Center buildings have signed a petition calling for a new—that is to say a real—investigation. “I thought initially that Gage might be on to something,” Mohr writes, “until I examined his science carefully” and debated him. In his article, he lists his responses to the controlled-demolition hypothesis. 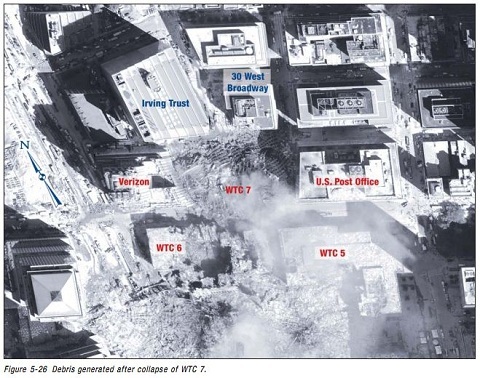 Sticking to the question of World Trade Center Building 7 (WTC 7), let’s examine Mohr’s arguments against the science behind the controlled-demolition hypothesis and in favor of the fire-induced collapse hypothesis. If you’re unfamiliar with WTC 7, you can watch it collapsing on 9/11 in the video below. Mohr begins his case with the argument that “You cannot secretly prepare a controlled demolition of the two World Trade Center buildings … without anyone noticing anything unusual.” He does not mention it, but we may presume he thinks it would be just as impossible in the case of WTC 7, the third WTC building to collapse completely on 9/11. The main point to be made about this assertion is that it is not a scientific argument, but speculation. It for starters assumes that nobody noticed anything unusual in the days, weeks, and months before 9/11. But is that true? Since this possibility was never actually investigated, and thus building workers were never interviewed and asked whether they noticed any suspicious activity going on, we don’t really know. Also, while it may seem unlikely that this could be done, if the actual scientific evidence disproves the fire-induced collapse hypothesis and proves the alternative, then one has a priori knowledge that however unlikely, this must have occurred. So we must turn to the science, which Mohr does get to, eventually, as we shall see. Mohr writes, “Though it is true that no tall steel frame buildings ever collapsed due to fire alone prior to 9/11, since then, other tall steel framed buildings have.” He is referring, of course, to WTC 7, which wasn’t hit by a plane. It did suffer significant debris impact damage from the collapse of the North Tower, but the National Institute of Standards and Technology (NIST), the government agency responsible for the investigation into the building’s collapse, acknowledged that the damage was neither an initiating nor determinative factor in the collapse. As the Federal Emergency Management Agency (FEMA) noted in its initial report, “Prior to September 11, 2001, there was little, if any, record of fire-induced collapse of large fire-protected steel buildings.” Following up on FEMA’s preliminary investigation, NIST noted in its final report that the collapse of WTC 7 “was the first known instance of the total collapse of a tall building primarily due to fires.” Richard Gage has observed that in every instance where a tall building (that is, a steel-framed skyscraper) has collapsed with characteristics like those of WTC 7, it was a known controlled demolition. I have said earlier that the United States is now totally frank about putting its cards on the table. That is the case. Its official declared policy is now defined as ‘full spectrum dominance’. That is not my term, it is theirs. ‘Full spectrum dominance’ means control of land, sea, air and space and all attendant resources. We see in this film that President Obama has furthered this agenda. A 2008 poll of 17 nations found that majorities in only nine of them believe that al Qaeda was behind the 9/11 terrorist attacks on the United States. Middle Eastern countries are especially likely to name a perpetrator other than al Qaeda. But even in European countries, large minorities said they do not know who was behind 9/11. Germany led in this sketicism of the official 9/11 narrative with 23% specifically citing the US goverernment as the perpetrator, as did 15% of Italians. A December 2010 poll revealed that an astonishing 89.5% of German citizens doubt the official 9/11 story. 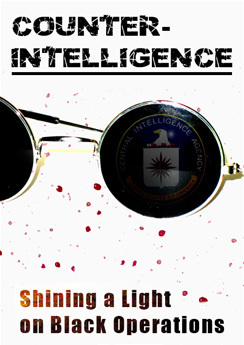 Millions of people around the world now believe that Western intelligence services, which are linked in their operations, organized the hidious attacks on New York and Washington on 9/11.